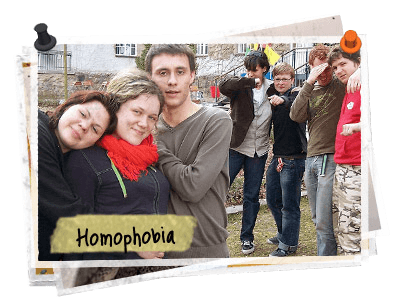 Homophobia is the fear of homosexuals – which often leads to bullying, violence, and even hate crimes. Often, homophobia stems from people thinking it is immoral or because it is against their religion, or not ever having the chance to get to know a LGBTQ person. Many times, with education and patience, misguided views about homosexuality can be overcome, but it may be too large of a burden for you to take on alone. If you are dealing with homophobia, reach out to a trusted adult for help. You can also find support and help through the It Gets Better Project.